Re: English Translation of Sai Prerana. I just felt the same when I was reciting SAI PRERANA that all the credit goes to the devotees who took the time and energy for our benefit and Sunita is very kind enough to do so quickly. I have already started reading 2 times a day and Sai bless her with all her sincere prayers. SaisiRavi ji thanks to you too for making it happen. You are Sai sent gift to us. Baba made you an instrument. When ever a devotee is going to chant "Sai Prerna", the credit goes to Ram Sai Prakashji, Priyaji and you. May BAba bless these wonderful souls always! Baba is working on one more miracle of getting the Audio done by a very great singer of Sai! Will share the details later after it materialises! Can anyone tel me ki ye sai prerna kya hey?is this anything like sai baavni? Sai bless you on this auspicious day Diwali. 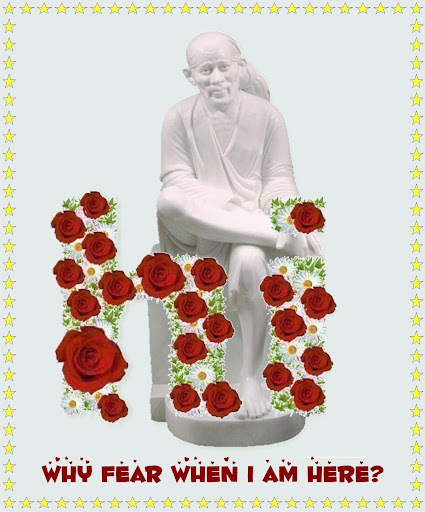 Already I see our Sai Prerana english translation has been reached to so many devotees. I am so happy that they get to read our Baba's nice message in a unique way. The credit goes to you for giving us all an oppurtunity to read. Baba bless you in every sec. Thanks Baba for sending such good devotees. I wish you a very happy and prosperous Diwali. May Baba bless all the devotees with Shraddha and Saburi on this auspicious day. Baba wanted His children to read 'Sai Prerana'. He used me and other blessed devotees as instruments to make this Prerana available to everyone. In fact, the whole credit goes to our Baba. Without His help and grace, I may not have been able to translate it. Not a leaf moves without His will. Subhasrini ji, thank you much for your kind blessings. Please keep me in your prayers. I pray that Baba blesses you in every way. You have done a wonderful work here by translating Sai Prerna. Dear Kabir ji, I'm humbled by your appreciation. Thanks for your kind words. Incidentally, I like your name very much. I pray that you live up to Kabir ji's legacy. May Baba bless you with His boundless love and grace. Hello to all Sai Friends! I am from abroad and maybe I've lost something... I'd be glad to know if Sai Prerana is intended to read in any translated language you choose (your language) or in original Hindi as a prayer or a mantra? Thanks, Sai Ram!!! your work and devotion is really appreciable. There are innumerable Saints in this world, but 'our father (Guru)' is the father (Real Guru). Others might say many good things, but we should never forget our Guru's words. I'll translate Sai Prerana into english for our non-Hindi speaking devotees. Sasiravi ji has just posted it on this forum. Thanks Sasiravi ji, may Baba bless you. I'll translate it chapter by chapter, one chapter every day. Tere sabh marg na khol du toh kehna. Please forgive any mistakes in my translation. yes you can read in english. Anywhere any time you can read this with devotion.